The July flower is Larkspur. Native to the North Temperature Zone, Larkspur is a genus of ranunculaceous delphinium plants with bright flowers and spurred calyx and symbolizes feelings of an open heart and ardent attachment. The term delphinium is believed to come from the Greek word for dolphin as the plant was thought to have a resemblance to the sea mammal. Folklore reveals a number of names for this flower including lark’s heel, lark’s toe, lark’s claw, knight’s spur and staggerweed. In Greek mythology larkspur sprang up from the blood of Alex after he killed himself following a temper tantrum resulting in an act of dishonour when he did not receive Achilles’ armour. Soldiers were also said to use larkspur in ancient times as a method to control body lice. Other healing uses that have been connected to the larkspur include the treatment of hemorrhoids, colic in children and wound repair. Larkspur was also said to have had magical powers as it carries feminine energy. In addition to healing wounds and combating lice, larkspur was used with any spell related to the protection, care and comfort of soldiers and other figures of authority. It has also been known to be used in ceremonies honouring war dead. Documentation points to larkspur assisting in keeping away ghosts, scorpions and various other poisonous creatures (Cunningham’s Encyclopedia of Magical Herbs) and if planted around a home it would keep away bad spirits. Wearing larkspur also brings these benefits. It has been used in many protection spells in Europe and one belief is that if bunches of the flower are hung in a stable, it would prevent the animals from being attacked by a predator or from being stolen. A legend from ancient Rome says men chasing a dolphin enraged Neptune who turned it into the Delphinium protecting it from capture. Contemporary medicinal uses of the larkspur centre primarily on the treatment of scorpion stings as an antidote. A myth pointed to laying delphiniums in the path of a scorpion as they would basically cause it to stop and freeze until the plant is removed. The flower is also associated with gaiety, levity and purity of heart. There are secret meanings to three colours including “Fickleness” (pink), “Joyful, Happy-Go-Lucky” (white) and “You Have Such A Sweet Disposition” (purple). Larkspur is a popular garden plant, which will grow up to between two and four feet tall. There are approximately forty different species of larkspur with hundreds of additional cultivars that horticulturalists have created. 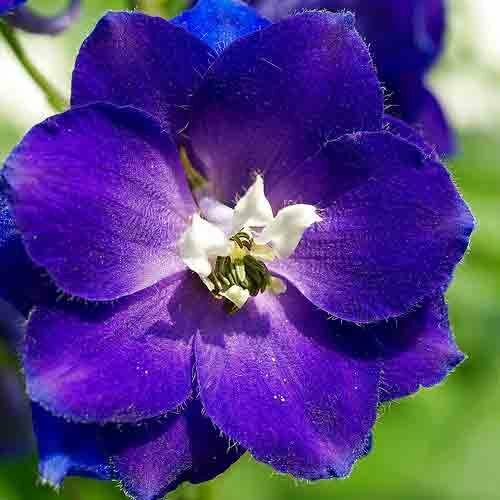 Larkspur is a poisonous plant which, when ingested, leads to nausea, vomiting, abdominal pain and muscular spasms. The spur of the flower, which is reminiscent of parts of a lark, created this flower’s name and the town of Larkspur, Colorado was named by the Governor’s wife Elizabeth Hunt in 1871. The abundance of delphiniums (larkspur) growing in the area led to this fitting tribute.